Welcome to TunerPro.net. TunerPro is a free, donate-if-you-like-it tuning platform aimed at making tuning easier and cheaper for the hobbyist and professional alike. TunerPro started life in early March of 2003 as an educational project and was originally created to tune GM vehicles between model years 1985 and 1995. TunerPro has since grown into a very robust tuning tool. The project has a few simple goals: It should be available for free in its essence, it should be better than whats available in its class, it should remain accessible to its target audience, and it should be fun for me to develop. TunerPro will continue to grow and evolve. I hope to continue to add support for other automobile (and maybe non-automobile?!) platforms out there. Stay tuned! I will continue to develop and improve TunerPro for as long as it is fun and as long as there is interest, support, and feedback. TunerPro supports many vehicle makes and models, including GM OBDI (pre-96), Ford EECIV and EECV, early and mid-90's Nissan, DSM (Mitsubishi), Buell, BMW, Porsche, Renault (Fenix 1 and 3), Ducati, and more. Definitions may be created for many other applications with more to come! I'm currently aware of users experimenting with Volkswagen, Subaru, and more. Tuning definition files can also be found elsewhere on the Internet, so if you don't find it here, consult your favorite search engine. Please explore TunerPro's features for yourself! Interested in the Author's Car? A new build of TunerPro has been uploaded. Check it out here. TunerPro is developed in C++ Win32 API (without MFC/ATL/COM) using Visual Studio on Windows 7. As of October 2010, TunerPro (version 5) in its entirety, including all custom controls, comprises 103,000 lines of code (just code lines - no comments or whitespace). TunerPro is a closed-source project. There is a simple plug-in SDK available to enable some opportunities for 3rd-party development. I enjoy learning from my experiences while writing TunerPro and its related software. Your feedback and support is always appreciated and encouraging. I own a 1989 Trans Am, 1227165 ECM, 6E mask. I like to think I know lots about my car. I know for sure that I know much less about other setups, so please consider other resources before asking me (personally) questions about your particular (different) setup. I might have an answer, but its probably not the best. See the resources/links and community pages on this web site. 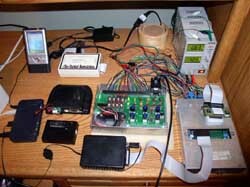 Below is an old picture of the development hardware that I used in the early days of developmkent. This hardware reduces the amount of code that has to be written from the driver's seat during development.